There are many applications where the accuracy of a digital or analogue (bar graph) is not required but something better than a simple low/high indicator is desirable. A battery charge level indicator in a car is a good example. This simple circuit requiring only two LEDs (preferably one with a green and red LED in a single package), a cheap CMOS IC type 4093 and a few resistors should ful-fil many such applications. With a suitable sensor, the indicator will display the relevant quantity as a colour ranging from red through orange and yellow to green. IC1.A functions as an oscillator running at about 10 kHz with the component values given, although this is not critical. Assuming for the moment that R1 is not commented, the output of IC1.A is a square wave with almost 50% duty cycle. The voltage at the junction of R2 and C1 will be a triangular wave (again, almost) with a level determined by the difference in the two threshold voltages of the NAND Schmitt trigger gate IC1.A. IC1.B, IC1.C and IC1.D form inverting and noninverting buffers so that the outputs of IC1.C and IC1.D switch in complementary fashion. With a 50% duty cycle, the red and green LEDs will be driven on for equal periods of time so that both will light at approximately equal brightness resulting in an orange-yellow display. With R1 in circuit, the actual input voltage to IC1. A will consist of the triangular waveform added to the dc input Vin. As the input voltage varies, so will the oscillator duty cycle causing either the red or the green LED to be on for longer periods and so changing the visible colour of the combi-LED. The actual range over which the effect will be achieved is determined by the relative values of R1 and R2, enabling the circuit to be matched to most supply voltages. With the component values given and a supply of 8 volts, the LED will vary from fully red to fully green in response to input voltages of 2.5 V and 5.6 V respectively. To monitor a car battery voltage, the battery itself could be used to power the circuit provided a zener diode and dropper resistor are added to stabilise the IC supply voltage. 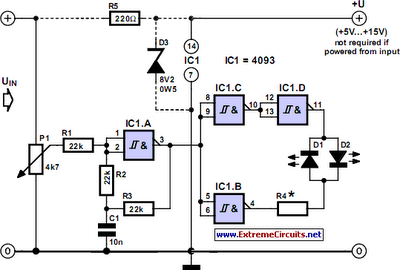 This is shown in dashed outlines in the circuit diagram. With an 8.2 V zener the dropper resistor should be around 220 ? and R1 has to be reduced to 4.7 k. The LED brightness is determined by R4. As a rule of thumb, R4 = (Vsupply – 2) / 3[k] and remember that the 4093 can only supply a few mA’s of output current. Applications of this little circuit include ‘non critical’ ones such as go/non-go battery testers, simple temperature indicators, water tank level indicators, etc.